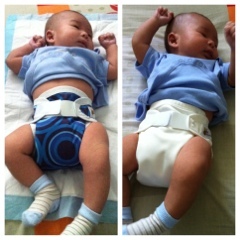 Baby Iqbal was around 7lbs at birth and when we started cloth diapering, he was already at 9lbs. 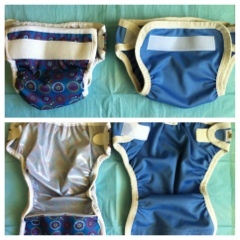 The one size (OS) cloth diapers still looks a little bit bulky to us so we used the traditional square white flats as a start with newborn size diaper covers. The flats were those I used 25 years ago along with my other siblings, so you can imagine how thin and small it got! Hehe! We only use cloth diaper during the day, change him every 2-3 hours or less if Dear Son (DS) poops and also do daily washing. 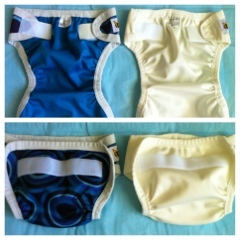 Overall, I do not like the plastic-ky feel I get from Bummis diaper cover and the red marks from the elastics. But I like the leg gusset (although I think we'll be fine without it. Baby's blowouts didnt usually leak but always get to the edges of the covers soiled). I like BBH cover as it does not give Baby red marks on his thighs. However, it is not wipeable and sometimes I can smell urine from the cover. Both covers have a very strong aplix/velcro. We are still using the covers occasionally as extra cover for the day (now Baby is almost 3 months old).